In medium bowl, toss potatoes with 2 tablespoons of the oil, 1/2 teaspoon of the salt and 1/4 teaspoon of the pepper. Add potato mixture to pan; roast 15 minutes. Meanwhile, in 1-quart saucepan, heat 1/3 cup vinegar to boiling over medium heat. Add brown sugar; cook 3 to 5 minutes, stirring constantly, until vinegar mixture is reduced and slightly thickened. Remove from heat; set aside. Cut pocket in each chicken breast by making horizontal slit along thin long edge, being careful to not cut through to opposite side. Stuff each pocket with 1 slice mozzarella and 1 tablespoon pesto. Press edges of chicken together to seal. Season chicken with 3/4 teaspoon of the salt and remaining 1/2 teaspoon pepper. Reserve 1 tablespoon of the vinegar glaze to brush on at the end. 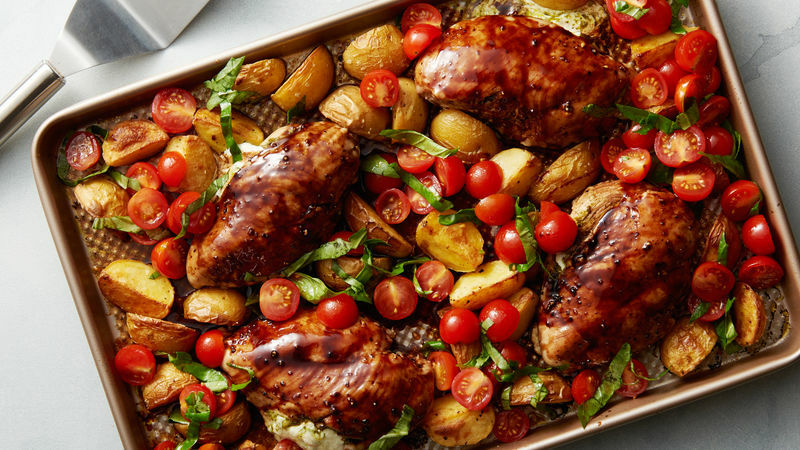 Place chicken on sheet pan with potatoes. Brush top of chicken breasts with half of the glaze. Bake 20 minutes. Brush with remaining half of glaze; bake 5 to 10 minutes or until juice of chicken is clear when center of thickest part is cut (at least 165°F) and potatoes are tender. Drizzle reserved 1 tablespoon vinegar glaze on top of chicken breasts. Meanwhile, in medium bowl, mix tomatoes, basil, remaining 1 tablespoon oil, remaining 2 teaspoons vinegar and remaining 1/4 teaspoon salt. Spoon tomato mixture over warm chicken; serve with potatoes. Brushing chicken with glaze a few times during cooking process ensures great flavor and a lovely dark lacquered appearance. Cherry tomatoes are a nice choice all year round, as they typically have good flavor, even when they aren’t in season.